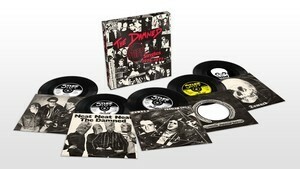 The Damned announced a five piece vinyl set The Damned: Stiff Singles 1976-1977. The limited edition 7" set contains the band's early singles including the band's previously issued fan-club exclusive "Stretcher Case Baby," (originally sent to fans in celebration of the band's first anniversary in 1977). The boxset will feature five 7" singles (see tracklisting below) with recreated original artwork, original press clippings, and an embroidered patch. The Damned: Stiff Singles 1976 - 1977 is available exclusive through Pledge Music. Check out the tracklisting below and pre-order here. The Damned teamed up with super-producer Tony Visconti and will return with a brand new studio record in 2018. The album is also available to pre-order through Pledge Music.